This article is about Applied Energistics 2 ME Auto Crafting system. You may be looking for ME Molecular Assembler Chamber from Applied Energistics. 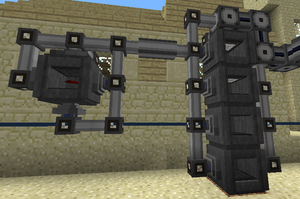 The ME Auto Crafting system is an expandable modular multi-block structure from the Applied Energistics 2 mod. An important feature of the ME Network. Once properly set-up the Player only need to order the items needed on demand by creating a crafting job and the system will automatically craft all needed parts from the resources available. All of the craft-able items do not use any storage space until crafted. Each item's recipe only needs to be "crafted" once and encoded on a Blank Pattern using the ME Pattern Terminal. Special "processing" recipes are also encoded with the Pattern Terminal for interaction with machines via an Interface. The Auto Crafting Structure can only be functional connected via an ME Controller. The Assembly multi-block structure is the part of the Auto Crafting that assembles the items from the jobs ordered. It is composed of one or more ME Interfaces connected up with a Molecular Assembler and managed remotely via the ME Interface Terminal. This structure may be designed to the Players fancy, as long as an ME Dense Cable is used to provide a connection with the necessary channels when using more than 8 Interfaces on the same line. The Molecular Assembler does not use any channels. Each Interface may be programmed with up to 9 crafting recipe Patterns that will tell the Assembler which resources to use in the crafting. The Interface will automatically collect the finished product and store it on the Network to an ME Storage Cell in the ME Drive. 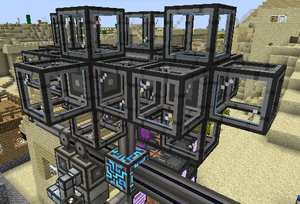 The CPU multi-block structure, which synchronises the Auto Crafting operations, is composed of a Crafting Storage (required), a Crafting Co-Processing Unit (recommended) and a Crafting Monitor (optional). 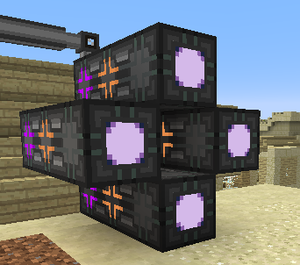 This structure provides the storage memory necessary for multiple simultaneous crafting orders. To be valid the parts need to be placed in a "cuboid" shape. Several of these structures may be interconnected in the Network. The entire Crafting CPU multiblock only uses one channel. A Crafting Unit may be placed to fill the structure into a valid shape, although it will serve no other purpose. The Monitor will display the item that is being crafted by the system and show a countdown of the number of items remaining to be crafted. Inscribers and machines are automated in a similar way as the Assembler with an Interface but programmed with a processing Pattern that will supply the proper material to the given machine as per the crafting job ordered. The finished product is collected using an ME Import Bus, an Itemduct or other transport system, connected back to the Interface . ↑ The Interface (Panel) cannot receive items nor power an Assembler or ME Device. It is important to return all Auto Crafted items to the ME Network, otherwise the item's job will remain pending. This page was last modified on 10 July 2017, at 16:47.